As I lay in bed next to my 7-month-old, waiting for him to fall asleep, I think about the conversation I had with a good family friend recently. On hearing about LJ's great progress in German (she is fluent by now), he brings back (because we have heard it before) a story about a bilingual friend of his who constantly mixed and confused languages, who could speak neither language "properly" and who remained so for his whole life. The story comes from the mouth of an educated, language-literate person who speaks a decent second language himself and uses it frequently. My heart sinks. There are still so many people in this world who think bilingualism is a negative thing and bilinguals are odds. 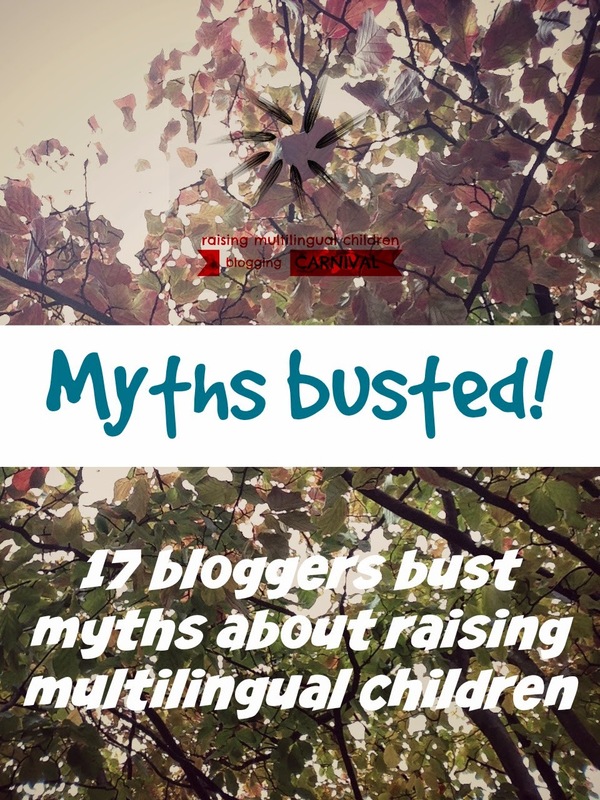 As it was my turn to host this month's blogging carnival on raising multilingual children, I thought this would be a perfect topic: Busting myths! The more we dispel these myths in our writing, the more, hopefully, people will stop saying these things, which, for the most part, are completely untrue and based on old stories. Without further ado, here the great contributions to the carnival from my fellow bloggers. Please do go and visit their articles. And please do spread the word! If there is one post to be shared, it is this one, so we end these ridiculous stories, the silly advice and crazy ideas. Olga outlines some reasons why this myth is so prevalent today. A lot of these reasons are based on fear. We tend to fear what we do not know well. Rita gives us the example of her daughter who translated for her when she was only 2! Confusion? I don't think so! Smart kid! Esther explains how this myth actually led some friends of hers to NOT raise their children bilingually. Sarah speaks of her greatest fear for her child: the language delay so often talked about. Seasons pass and the delay does not come. Cordelia reminds us that, as parents, we do beat ourselves up, if our children happen to be late talkers. Bilingualism, has nothing to do with it. We know it, but still worry. Poor child indeed! 3 languages. What silly parents! Marianna relates her latest bakery encounter. Many studies show that autistic children, for example, make great bilinguals. Olga write more about this here. Bilingualism is not the problem if your child has other developmental issues. Here is some great advice as to what to do in that case. Rita gives us plenty of reasons why this is not a good idea. A very useful post if this has been said to you. Malu shares first hand experience of her own learning of English as the majority language outside home. Like many other skills you may try and teach your child, success is not guaranteed. Eowyn gives her readers some ideas to parents who think they are having trouble. It does! Galina tells us it gives the child the basis s/he may need for further learning. I couldn't agree more with her. I also wrote about how LJ has been learning English completely passively with great results. As Eowyn reminds us, non-native speakers often have more formal qualifications and may be even better suited to teaching a language. She also, here, helps non-native parents decide for themselves whether they would be able to pass on a language. Esther took on the brave challenge of adding Mandarin to her children's languages even though she is no native speaker. Her saviour? The internet! Ute outlines several strategies that can be used to pass on a language when monolingual. No, it does not. And here are some reasons why it may not work and what you can do to solve the problem(s). Aimee did just the opposite. She introduced a second language as quickly as she could. She does not regret it. No research supports this claim. It may be a useful guideline for some. But this is all it is. This is what I have to say about it. Sure they do! If you look at one language only. But research tells us bilinguals fall within monolingual norms (if we really want to compare them). Here are a few other articles that round up some of those myths. Next time someone says one of these things to you, point them in the direction of these articles. 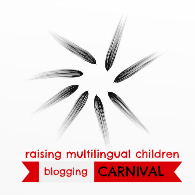 Olga, writing at InCultureParent lists 10 things not to say to parents of multilinguals. Becky, guest posting at All Done Monkey, also highlights 5 myths not to believe. Carol busts 5 myths for us, giving as examples her own family life. Kali shares her top 5 myths and admits that most are based on her own insecurities. Over at Bilingüe babies, you can find 4 myths being debunked for the sake of learning together all the time. Ute writes an excellent discussion about some common myths including one about number of words and early versus late learning. And my own, which also includes why changing strategy can be done and can work. Last but by no means least, maybe my favourite post of the month (am I allowed to write this? ), learning two or more languages CAN be easy and does NOT necessarily requires any sacrifice at all. Thank you Stephen for this very honest post. Many thanks to everyone who took part. Come and join the fun here. And see you next year! *thanks Stephen for the title inspiration! ** I have crossed out the headers on this post for fear anybody skimming over this post may think these are all true. 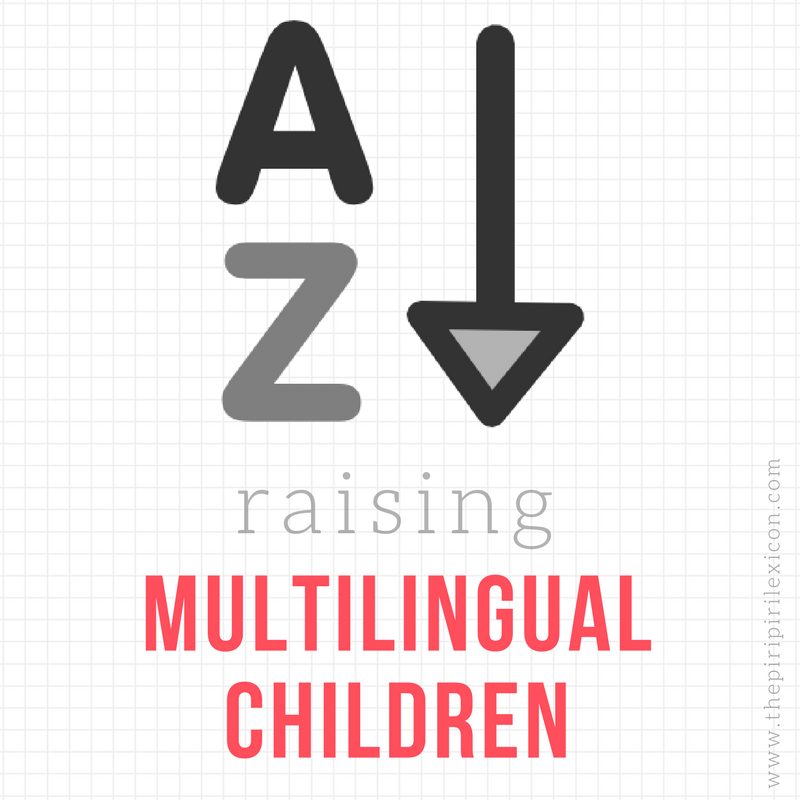 I am very thankful for this post, which has turned out to be an invaluable resource guide for parents raising their children multilingually as well as for those considering this path for their family. I love how we are all at different stages of the journey, strewn across the planet in different locations and exposing our children to different languages, yet fighting similar external myths (and let's be honest, internal / our own fears). As for individual myths, I had hoped someone would look into the "special needs kids cannot become bilingual" but I didn't have first-hand examples to back it up with. So happy to see it here. So encouraging along the ups and downs of our own journey. Thank you, Annabelle for the topic and this fantastic summary. I've known bilingual people who speak (and write!) both their languges perfectly and others who speak the language of the country they were born in perfectly, the second language slightly less well but cannot write in the second language to save their lives. There's no one rule that fits all. And I think it's a real shame my grandad never taught his children any Ukranian - or even Russian. He himself was brought up bilingual Ukranian/Russian (in those days, everyone had to learn Russian by law) and spoke 6 languages by the time he died. But he didn't speak his language to his children because he considered Ukranian a "useless" language and hoped they would never go to his country. Annabelle, thanks for gathering such a positive, inspiring group of posts for us! Happy holidays.